This wonderful, intimate family-owned resort with only 4 bures is the only eco resort on Taveuni Island. With its own family-operated diving, snorkeling and adventure programs, this tropical sanctuary is also home to the largest freshwater swimming pool on the island. As an eco resort, Nakia offers fresh delicious organic cuisine, a comfortable and relaxing environment using sustainable natural energy, and warm hospitality that makes their guests feel like they are part of the family. Each bure has a veranda and hammock overlooking the Somosomo Strait, on-demand hot water, 24-hour 240 volt power, daily maid service, ample beach and bath towels, ceiling fans, cool tile floors, comfortable locally–made furnishings, premium mattresses, side tables and chairs, ample closet space, a refrigerator, locally-crafted, decorative mats, fabrics and wood carvings, and fresh tropical flowers. Sunset, Forest and Garden Bures – The 3 standard bures, sleeps up to one couple and a child with a Queen bed and a child's cot. 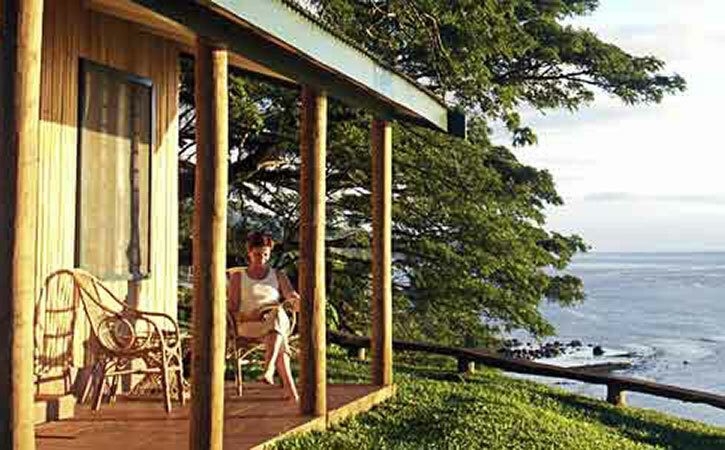 Somosomo Bure – 2 bedrooms and 2 baths, sleeps up to 8 people in a King bed, 2 queen beds, and a Double bed. Through Taveuni Ocean Sports at Nakia, Julie Kelly, the daughter of Nakia's owners, and partner Aaron Mell – offer scuba diving, snorkeling, surfing, and boating. They are licensed and insured PADI (Professional Association of Diving Instructors) Instructors with more than a decade of teaching and certifying divers at all levels of ability. Their priorities are safety and fun – we welcome guests from every resort on the island. Come dive or snorkel with Nakia to see for yourself why the Cousteau family calls Fiji "the soft coral capital of the world" and why Scuba Diver magazine has repeatedly rated Taveuni dive sites among the top ten on the planet. The tidal current and constant year–round water temperature of the Somosomo Strait create an ideal environment for more than 390 species of corals, marine creatures such as anemones, turtles, eels and nearly 1500 kinds of fish. Fiji's world–class reefs were featured in a November 2004 National Geographic article and online video. Using Nakia's 12–meter (40–foot) fresh-water pool and the many open water sites along the reefs of the Somosomo Strait, we introduce new divers to the sport, help certified divers reach the next level, or refresh occasional divers' skills. We have courses and excursions for everyone, ranging from beginning snorkeling, through basic dive instruction, to certification programs for new divers, open water divers, and rescue divers. Every program includes detailed safety, site and marine biology briefings. Their dive boat, The Upwelling, is a 10–meter (34–foot) custom aluminum catamaran. Equipped with GPS, sonar, VHF radio, emergency oxygen, an extensive marine first aid kit, and lifejackets, it supports up to 12 divers. But they carry no more than 8 divers with two instructors, in order to match divers' experience levels and preferences with the features and challenges of dive sites. Every trip includes delicious snacks and cold beverages. Half–day and longer excursions include lunch. Hot fresh water showers are available on board.